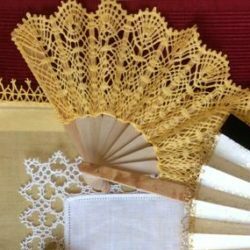 Lace maker, teacher and author covering a wide range of bobbin lace - with a special interest in linen and metallic laces of the 16th and 17th centuries - also needle lace and craft laces such as tatting crochet, knitting and Carrickmacross. Regular classes in Newcastle and Corbridge. Welcomes invitation to tutor workshops on all aspects of early bobbin lace. Sixteenth and seventeenth century bobbin lace.